The Pasadena Playhouse (Sheldon Epps, Artistic Director and Elizabeth Doran, Executive Director) and Lythgoe Family Productions, announced today that, due to popular demand, an extra week of holiday performances of A SNOW WHITE CHRISTMAS has been added for this limited engagement. Performances will begin December 13 and continue through December 30, with a gala press opening night on Wednesday, December 12, 2012, at 7:00 p.m. at The Pasadena Playhouse. Three student matinees have also been added on December 13, 14 and 20. The production stars Ariana Grande (Nickelodeon’s “Victorious”) as “Snow White,” an on-screen appearance by Neil Patrick Harris as “The Magic Mirror” and Charlene Tilton (“Dallas”) as “The Wicked Queen.” This inaugural “Panto at The Playhouse” production of A SNOW WHITE CHRISTMAS will be directed by Bonnie Lythgoe (“So You Think You Can Dance”) with choreography by Spencer Liff (Emmy nominee, “So You Think You Can Dance”) and musical direction, additional music and arrangements by Michael Orland (“American Idol”). Three student matinees have been also added on December 13, 14 and 20 at 12:00 p.m. These performances will host underprivileged schoolchildren and youth organizations from the Pasadena and Greater Los Angeles areas. The student matinees are provided at no cost to the students and bus transportation is fully sponsored by Ovation, who is also premiering the making of The Lythgoe Family’s A SNOW WHITE CHRISTMAS – “A Snow White Christmas: Opening Night” – on Thanksgiving Day, November 22, at 5:00 p.m. Pacific/8:00 p.m. Eastern. Check local listings for details. Proceeds from opening night gala patron sales will fund this student matinee program. For information on supporting the student matinees as a patron, contact Kim Ruppert at kruppert@pasadenaplayhouse.org. An updated version of the classic tale, in the style of a traditional British family Panto, A SNOW WHITE CHRISTMAS features family-friendly magic, with a comedic twist, dancing (with “So You Think You Can Dance” alumni), a live miniature pony and contemporary music from Katy Perry’s “Firework” to Huey Lewis and the News’ “Power of Love” to Michael Jackson’s “Thriller” and more. A Panto is known for its interactive style and humor that appeals to everyone from ages 2 – 102! Before every performance, guests and their families are invited to enjoy a “Winter Wonderland” event in The Playhouse’s Engemann Family Courtyard, complete with holiday music, crafts, activities, games and photo opportunities. In addition to director Bonnie Lythgoe, the creative team for A SNOW WHITE CHRISTMAS includes choreography by Spencer Liff (Emmy nominee for “So You Think You Can Dance”), musical direction, additional music and arrangements by Michael Orland (“American Idol”), book by Kris Lythgoe, scenic and costume design by Lythgoe Family Productions creative department with additional costume design by designer Julia Clancy, Donna Maas and Kleev Guessford, additional scenic design by J.J. Wickham (LFP producers include Kris Lythgoe, Bonnie Lythgoe, Becky Baeling and Jason Haigh-Ellery). A SNOW WHITE CHRISTMAS will play from December 13 – 30, 2012 with a gala press opening on Wednesday, December 12, 2012, at 7:00 p.m. The Pasadena Playhouse is located at 39 South El Molino Avenue, Pasadena, CA 91101. The performance schedule is Tuesday through Friday at 7:00 p.m.; Saturdays at 11:00 a.m., 3:00 p.m. and 7:00 p.m.; and Sundays at 11:00 a.m. and 3:00 p.m. There are no performances on Tuesday and Wednesday, December 18 and 19 as well as Christmas Day. A special Christmas Eve performance will take place on December 24 at 7:00 p.m. Single ticket prices for A SNOW WHITE CHRISTMAS range from $32.00 – $72.00, with Premium Seating available for $100.00. Child single tickets are available for Rear Orchestra and Rear Mezzanine seating ranging from $22.00 – $47.00. Family ticket packages are available at $99.00 (weekday performances, Rear Orchestra), $159.00 (weekday, Front Orchestra/Front Mezzanine; weekend performances, Rear Orchestra) and $199.00 (weekend and Christmas Eve, Front Orchestra/Front Mezzanine). Golden Tickets are available as an add-on to any child’s ticket for an additional $100.00 each and are limited to 10 Golden Tickets per performance. A Golden Ticket allows the ticketholder (children only) a special on-stage experience during the production. Admission to the “Winter Wonderland” event is complimentary to all ticket holders (select activities require an additional purchase) and begins 90 minutes before every performance. Service and theatre restoration fees apply to all purchases. Tickets are available by calling The Pasadena Playhouse at 626-356-7529 or by visiting The Pasadena Playhouse Box Office, Tuesday – Sunday from 12:00 p.m. until 6:00 p.m. during non-performance dates. On performance dates the Box Office is open Tuesday – Saturday from 12:00 p.m. – 8:00 p.m. and 12:00 p.m. – 7:00 p.m. on Sunday. Tickets are available 24 hours online at www.PasadenaPlayhouse.org. Group Sales (8 or more) are available by calling 626-921-1161. For additional information visit www.PasadenaPlayhouse.org. Full bios for the cast and creative team of A SNOW WHITE CHRISTMAS are available upon request. SNOW WHITE FINDS HER PRINCE! The Pasadena Playhouse (Sheldon Epps, Artistic Director and Elizabeth Doran, Executive Director) and Lythgoe Family Productions, announced today that Curt Hansen (Broadway’s Next to Normal and Hairspray) joins the cast as “Snow White’s Prince” in A SNOW WHITE CHRISTMAS. The production also features the previously announced Ariana Grande (Nickelodeon’s “Victorious”) as “Snow White,” an on-screen appearance by Neil Patrick Harris as “The Magic Mirror” and Charlene Tilton (“Dallas”) as “The Wicked Queen.” Auditions for child performers to play the “Seven Dwarfs” will be held on October 5 – 6 at the Westfield Santa Anita mall. This inaugural “Panto at The Playhouse” production of A SNOW WHITE CHRISTMAS will be directed by Bonnie Lythgoe (“So You Think You Can Dance”) with choreography by Spencer Liff (Emmy nominee “So You Think You Can Dance”) and musical direction by Michael Orland (“American Idol”). Performances will begin December 13 through December 23, with a gala press opening night on Wednesday, December 12, 2012, at 7:00 p.m. at The Pasadena Playhouse. Single tickets are also now on sale. Lythgoe Family Productions produces fun, musical theatre the whole family can enjoy. Known for their creativity and involvement in television hits “American Idol” and “So You Think You Can Dance,” the Lythgoes are dedicated to bringing affordable theatre to families across America. Based on the Grimm fairytales, each story has been modernized with topical scripts for parents and well known pop songs for kids. The Lythgoes pride themselves on creating a memorable experience a family can share together. Auditions for child performers (ages 5 – 13) to play the “Seven Dwarfs” will be held October 5 – 6 at the Westfield Santa Anita mall (400 S. Baldwin Avenue, Arcadia, CA). Celebrity judges, including Lindsay Arnold and Witney Carson from this season’s “So You Think You Can Dance” will be monitoring auditions along with director Bonnie Lythgoe. Past judges have included Neil Patrick Harris, Nigel Lythgoe, Mary Murphy (“So You Think You Can Dance”), Kara Dioguardi (“American Idol”) and Mark Ballas (“Dancing with the Stars”). Kids can also take photos with “Snow White.” For more information visit www.mpient.com. In addition to director Bonnie Lythgoe, the creative team for A SNOW WHITE CHRISTMAS includes choreography by Spencer Liff (Emmy nominee for “So You Think You Can Dance”), musical direction by Michael Orland (“American Idol”), book by Kris Lythgoe, scenic and costume design by Lythgoe Family Productions creative department with additional costume design by designer Julia Clancy, Donna Maas and Kleev Guessford, additional scenic design by J.J. Wickham (LFP producers include Kris Lythgoe, Bonnie Lythgoe, Becky Baeling and Jason Haigh-Ellery). Curt Hansen (“Snow White’s Prince”) grew up in Wisconsin and now lives in New York. 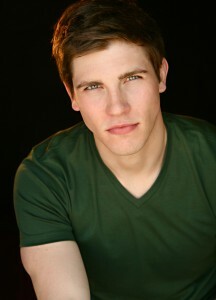 Broadway credits include Next to Normal (as well as the National Tour) and Hairspray. Regional theatre credits include Parade at the Mark Taper Forum. On television, Curt has appeared on Nickelodeon’s “Big Time Rush” as Dak Zevon and CBS’ “The Good Wife.” Selected NYC staged readings include: IT’S ON (NYMF), bare, Charlie and the Chocolate Factory and The Flamingo Kid. A SNOW WHITE CHRISTMAS will play from December 13 – 23, 2012 with a gala press opening on Wednesday, December 12, 2012, at 7:00 p.m. The Pasadena Playhouse is located at 39 South El Molino Avenue, Pasadena, CA 91101. The performance schedule is Tuesday through Friday at 7:00 p.m.; Saturdays at 11:00 a.m., 3:00 p.m. and 7:00 p.m.; and Sundays at 11:00 a.m. and 3:00 p.m. 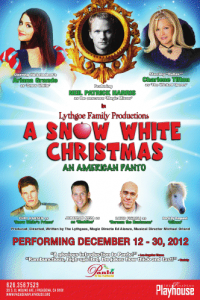 Single ticket prices for A SNOW WHITE CHRISTMAS range from $32.00 – $72.00, with Premium Seating available for $100.00. Child single tickets are available for Rear Orchestra and Rear Mezzanine seating ranging from $22.00 – $47.00. Golden Tickets are available for an additional $100.00 each and are limited to 10 Golden Tickets per performance. A Golden Ticket allows the ticketholder (children only) a special on-stage experience during the production. Admission to the “Winter Wonderland” event is complimentary to all ticket holders (select activities require an additional purchase) and begins an hour and a half before every performance. Service and theatre restoration fees apply to all purchases. Tickets are available by calling The Pasadena Playhouse at 626-356-7529 or by visiting The Pasadena Playhouse Box Office, Tuesday – Sunday from 12:00 p.m. until 6:00 p.m. during non-performance dates. On performance dates the Box Office is open Tuesday – Saturday from 12:00 p.m. – 8:00 p.m. and 12:00 p.m. – 7:00 p.m. on Sunday. Tickets are available 24 hours online at www.PasadenaPlayhouse.org. Group Sales (8 or more) are available by calling 626-921-1161. For additional information visit www.PasadenaPlayhouse.org.